Scott’s been speaking lately of shortbread. Although in a Disney household like ours, we frequently refer to it as “shorts-bread”. If you’ve had the shorts-shaped shortbreads (Say that 5 times fast!) from the Disney parks, you’ll know the deliciousness to which I refer. I have this coconut flour, which is really cool stuff. So I figured I’d try my hand at something at least resembling shortbread. And while I’m in the same city as shortbread, and perhaps in the next neighborhood over, these didn’t quite make it. Although they’re pretty darned tasty. As usual, I cobbled together a recipe based on various things found online. And based on what I have in my own kitchen. 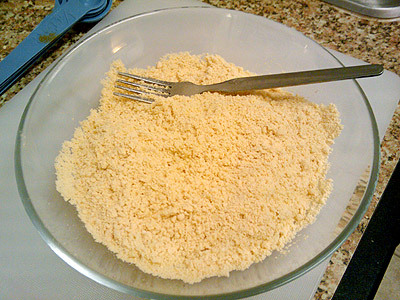 First I mixed the dry ingredients: coconut flour, almond meal, whey powder, salt, baking powder, and a little xanthan gum. A lot of the online recipes have more than one flour in there — in addition to the coconut flour, I’ve seen wheat flour, rice flour, millet flour, barley flour, quinoa flour, and even teff flour. What the what is teff flour? There’s the wikipedia entry. I’d prefer to call it lovegrass flour. But alas, I don’t have any of those other flours. So I used what I had. 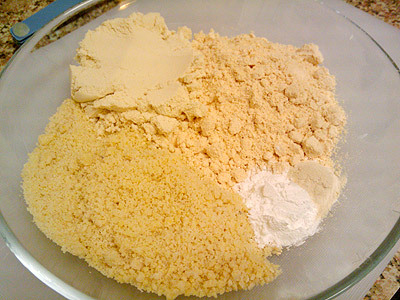 Both the coconut flour and the almond meal are from Bob’s Red Mill. I also got a bag of coconut flour from the oddly-named Let’s Do…Organic!, which I haven’t cracked open yet. The LDO is a noticeably coarser grain than the Bob’s — a little finer than my almond meal, while the Bob’s is powdery like real flour. I added both whey powder and xanthan gum because they both have emulsifying properties, which are helpful when you’re not using gluten. You could totes leave either one out. Or both. Whatevs. I don’t own a sifting device. My colanders all have holes way to big to sift with. So I just mixed the dry stuff up with a fork, and smashed the really obvious lumps. I’m a totally cautious baker, yo. Next step: wet stuff. I creamed the butter, sweetener (Splenda), and vanilla extract. Man, that vanilla had the Splenda dissolving right away. It kind of hissed and bubbled. Disturbing, but cool. 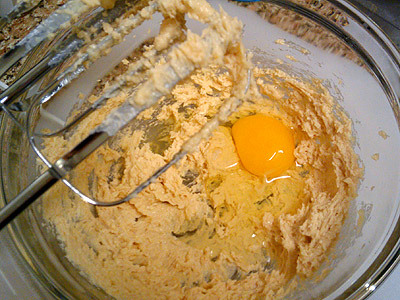 Add the eggs to the creamed butter/sweet/nilla goo. 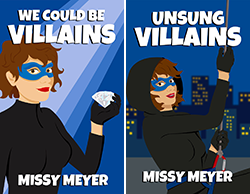 I think I was probably supposed to add them one at a time, but I just tossed all three in together and blended it up. Did I say I was cautious? Oh yeah. Some recipes would have you roll out your dough. This stuff was too sticky. And I was too impatient (and cautious) to chill the dough in the fridge, like you would with a butter cookie. So instead, I gave it the peanut butter cookie treatment — rolled it into balls with my hands, then smooshed them down flat. I tried a row without the rolling, just slopping a wad of dough onto the baking sheet and flattening. Hey, this is a test batch. 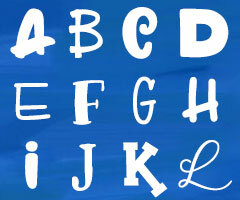 Best to try all possible methods, to find the laziest most cautious method possible. Oh, and hey — I tried to smoosh them flat with a drinking glass. The dough stuck. Drinking glass with plastic wrap on it, covered in butter? Likewise stuck. So I used my good ol’ hands. My veiny, tendon-rific hands. I never though I’d lose so much weight in my hands. Weird. And there they are, little cookies! Two dozen, approximately 2″ across. They didn’t spread much at all, they just rose a little bit. So smooshing was definitely the way to go. As you can see, some of these are a slightly different color — I did 16 cookies normally, then added some cinnamon and allspice to the rest of the dough. So 8 of them are sort of spiced. But I didn’t use quite enough spice. Mix the first 6 ingredients (the dry stuff). 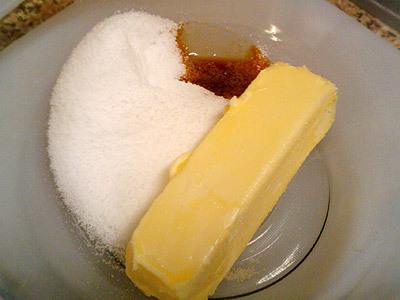 Then cream the butter, sweetener, and vanilla together (remember, sugar is a “wet” ingredient). Add the eggs, mix. Then gradually add the dry mix to the wet stuff (I did it in 3 parts). Roll into balls (or not, depending on your personal caution level) and smash down to 1/4-inch high or so. 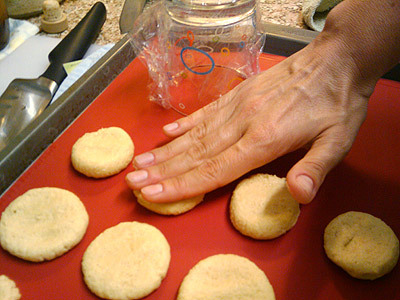 Use a non-stick baking sheet, or parchment paper, or a silicon pad. These are buttery, but I still worry about stickitude. Bake for 12-15 minutes at 350° F.
So they’re softer than shortbread — fairly cakey for cookies. In fact, one might even call them snickerdoodleish. But they’re really tasty. And I bet they’d be even tastier with the cream cheese frosting I used in my cookie sandwiches. Because everything’s better with frosting! 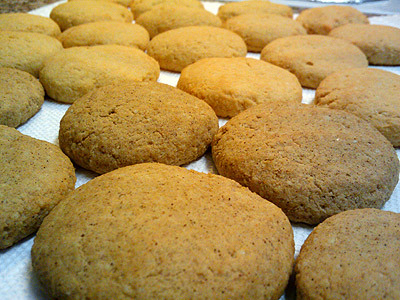 OR, you could embrace the snickerdoodleishness, and roll them in some cinnamon/sweetener mix before baking. NOM.